I dreamed of being a published mystery author for years. In 2015 my dream came true, when I published Just Killing Time, the first in the three book Clock Shop Mystery series. The series is published by Berkley. 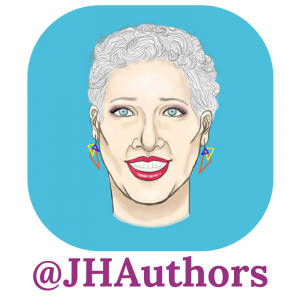 When they asked me to pick an author name, I went with Julianne Holmes, a family name. I didn’t realize the connection to Sherlock Holmes, but it works! More information about that series here. Though the three books in the Clock Shop series were the first books I published, there weren’t the first books I wrote. In 2017 the first book I wrote and tried to publish found a home with Midnight Ink, another wonderful publisher. Since theater and mysteries intersect in this series, and in my life, I decided to publish under my name, J.A. Hennrikus. Holding A Christmas Peril in my hands was a thrill, and I look forward to the publication of With A Kiss I Die in April of 2019. More information about that series here. I’m thrilled to join the Kensington publishing community with my Garden Squad series debuting in 2019. Pruning the Dead was released January 29! I’ve chosen the name Julia Henry for that series. Yes, another JH! That way all of my books will be in the same area of your local bookstore. Tilling the Truth will be released in August 2019! There’s more about how JHAuthors came to being here. Want to keep up with the latest news? I do occassional posts here, and you can also sign up for my newsletter here. The newsletter is a work in progress, but is coming soon. I promise I won’t send it out too often–four times a year. On the 20th of every month I blog on Killer Characters. I am also a regular contributor to the Wicked Authors. I’ve been using Instagram a lot, and post on Facebook. I use Twitter mostly to live tweet events and TV shows, so join me there!